Overview of the Elektra slot. There’s just no missing Elektra, a character who stands out thanks to a striking red outfit and dangerous good looks. Though this is one of Marvel’s less widely known characters, Elektra has a cult following and it’s no wonder that she was chosen to grace one of Playtech’s special comic book slot games. The combination of her eye-catching style and the slot’s interesting features makes this a winner. The Elektra slot is a 5-reel game with 20 paylines and a juicy progressive jackpot. The slot game matches the comic’s themes with oriental fonts and symbols. The game showcases not only Elektra herself in her stunning ninja garb, but also a variety of her signature weapons. Fans of both the comics and the movie will enjoy joining her quest while hoping for some jackpot cash. Let’s examine this game and iconic comic book in more detail. Those who are relatively new to comic books could be forgiven for not knowing who Elektra is. She is often eclipsed by big names like the Avengers and she often appears as a foil to other characters, such as Daredevil. This beautiful character (full name Elektra Natchios) first appeared in Daredevil comics back in 1981. Frank Miller of Sin City fame created her as a love interest for Daredevil but she since gained popularity as a standalone character. Elektra was taken to the big screen in 2003 as a supporting character in Daredevil, then later in 2005 in a spin-off, played by Jennifer Garner. More recently she was portrayed by Elodie Yung in the Daredevil TV series. In all her incarnations, she is a deadly assassin with martial arts skills and her iconic twin daggers or ‘sais’. 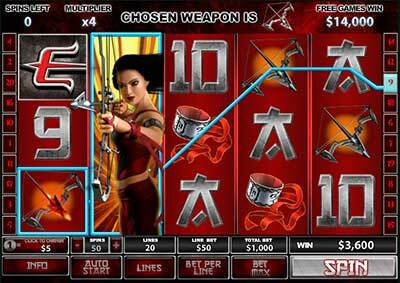 This slot game captures the essence of her vast skillset by featuring all her favourite weapons as symbols. The Elektra slot starts off with a splash screen or title screen showing Elektra in all her glory. She is drawn closer to her comic book look rather than trying to emulate the likeness of Jennifer Garner. She artwork is really good and manages to capture the air of mystery of this character, while also showing her in mid-action, throwing a deadly shuriken. Use of a red theme and Japanese font reinforces the vibe. The main symbols on the reels are shown in the same font, then you have Elektra’s shuriken and crossbow as higher scoring symbols. There are also Japanese cuffs and necklaces. The iconic sai daggers appear as the top scoring symbol, then Elektra herself is the wild, very appropriately. On a separate note, the game features the Marvel power bonus round which is seen on other Marvel slots and takes you to a more colourful grid screen. The Elektra slot is very easy on new players, having all the core mechanics of a standard 5-reel video slot and a very fuss-free feature. This is a 20-line slot, which allows you to bet on 20 combinations of symbols, not just across the middle. You can click the buttons on the sides to get a better idea of this, or just bet max to choose them all. Note that this increases your wager. The most valuable symbol is Elektra’s twin sais, but Elektra herself is wild and substitutes for all symbols except for scatter. She can appear on reels 2, 3 and 4 and during free games she will expand to cover the whole reel so she’s very valuable. The top symbol to look for is the E symbol which is both a scatter and triggers the Weapon Bonus if you get three or more in view. This is where the game’s ‘choose your weapon’ tagline comes in, letting you pick sais, crossbow or shuriken as your instrument of death! The sais give you 10 free games, the shuriken gives 14 free games with a x2 multiplier and the crossbow gives 7 free games with a x4 multiplier. It’s a very simple approach and gives you a little variety without complicating matters. Finally, look out for the four Marvel power symbols triggering on any spin, which puts you in the progressive jackpot mini game.